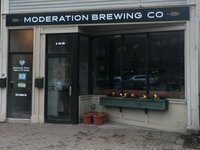 Really neat, tiny (cozy) little nano brewery, with some really friendly people running the show. Kind, knowledgeable staff know everything that's going into the beer, and are more than willing to take the time to talk with you about it. The place is bright, clean, with a view of the kettle, fermenter, and brewing equipment. Constantly rotating selection of freah beer on tap, and their hop game seems to be well dialed-in. Some unique rustic options as well. Food is also available. Have not seen it terribly crowded, but also haven't been in summer, either. A small, neat, comfortable little spot to try some fresh local beer, and perhaps grab some lunch.